on Wiki For You. In that article you will find some useful Google Chrome Extensions for Webmasters. This one is also similar to that. 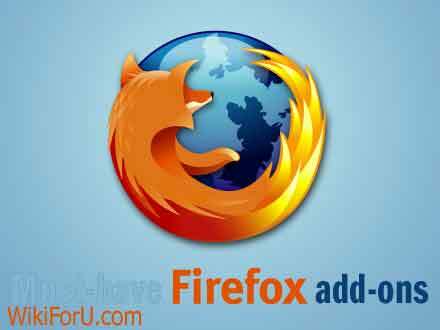 Here you will find best Mozilla Firefox's Addons for Bloggers and Webmasters. These can be very helpful for you, if you are a webmaster or a website owner and with the help of them you can do your work too fast. Before the launch of Google Chrome, Mozilla Firefox was the best and most used web-browser for computers. After Google Chrome's release, the popularity and users of Mozilla Firefox decreased rapidly. Now they (Mozilla) realized their mistake and launching their new versions one after one. Now Mozilla Firefox 9 is static version that is available for download from official Mozilla's website. You can bookmark and tag feeds. This also provides a search option for quickly accessing your feeds. It supports keyboard shortcuts, which makes your work even faster. It update feeds in background and provides you full control on how often it will updated. Secure browsing for Gmail and Google Calender etc. In Google Images Search, it changes all image links to direct image links. This feature is very good and most useful. In search results, Show Favi-icons of sites. Shows filtered results from spam links etc. It is also known as DTA. This is also very useful add on. It lets you download whole images of a webpage with a single click. According to its developers, it increases the download speed by 400%. This also provides some other capabilities such as , Download pause, resume etc. This is very powerful download manager for Firefox that available for free. Most of you may already know about it. Don't you know ? OK....Actually this is a powerful add on which provides you features of accessing your Gmail Inbox messages directly from your Firefox...no need to sign in again and again. And other good thing is that it doesn't allow you only one account, instead, you can add a number of accounts without logging out from one. This provides you real multi-tasking while you are blogging. You can read your emails alongside browsing internet. There is also a good feature of quick replying. This is most famous analyzing add on for Search Engine Optimization. This Addon is available for most browsers. This is available for Firefox, Google Chrome as well as for Opera. Now it is also available for Apple Safari. This is a handy tool for analyzing your website's SEO. I tells you how good your website is in SEO. This provides some special features like: Google Pagerank, Alexa Rank and Keyword Density etc. It also lets you find which word comes how many times in a web page.